I have been impressed in my first two months at Harvard Business School about how well the school is structured and organized. 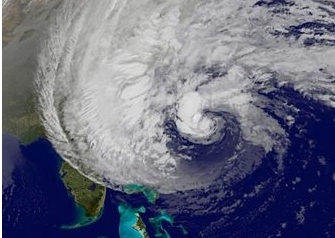 However, there seems to be one thing that can stop the HBS machine: a hurricane called Sandy. All students and staff of HBS received an email of the office of the dean on Sunday 10/28 at 7.50PM stating that “following a University-wide conference call with representation of each of the [Harvard] Schools, and given concerns about personal safety and the hazards people are likely to encounter on the roads, it has been determined that Harvard University will follow [Massachusetts Governor Patrick’s] request [to close local schools and universities].” In summary, HBS will be closed. In their defense, Sandy also stopped all transportation systems on the East Coast of the US and will probably cause billions $ of damage. As I moved to the US a couple of months ago to start the MBA program at HBS, I knew that part of my experience would be about living in the US and getting used to the US way of living. One thing I hadn’t thought of however was that I would have to deal with another US specificity – a full-blown hurricane! 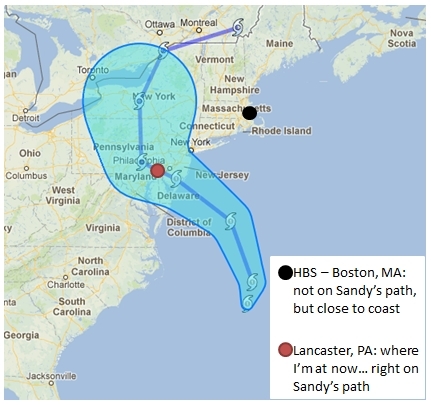 Moreover, as I left Boston for the weekend to attend a wedding in Pennsylvania, I will be right on Sandy’s path. As the wind becomes stronger and stonger and the rain keeps on pouring down, I know that it’s probably a question of hours before electricity shuts down and we go into ‘survivor’ mode. As I’m following Sandy’s progress on TV, here’s what I learned on preparing for a hurricane. First, make sure you have a flashlight and candles. As most electric wires are still above ground, chances that a tree cuts the wires are very high. Second, fill the bath with water. It might be your only source of water to flush the toilet and to clean up some in the coming days. Third, have some food and water in the house, but then again not too much, as power-cuts will make the food in your fridge/freezer go bad anyway. Finally, it seems important to stay away from windows and to have ‘safe room’ like a basement or so should the hurricane hit hard. Of course, these rules aren’t very effective for people living in coastal areas, where the risk of floods have forced thousands of people to evacuate their homes. But let’s get back to HBS. A new email just arrived from the office of the dean this Monday evening 8.57PM, stating that “Harvard Business School (and all of Harvard University) [will] reopen tomorrow, with a full schedule of classes and activities.” Besides some minor damage caused to McCulloch Hall by a falling tree, the campus seems to be fine. So the question remains how I will make it back to Boston in the coming days. Let’s hope the airlines can get their act together by Wednesday. Sandy, don’t be too hard on us! This entry was posted in Life in the USA and tagged Boston, dean, HBS, hurricane Sandy, survivor. Bookmark the permalink.